Great Lakes Kennel Club Redevelopment TIA - TADI - Traffic Analysis & Design, INC. Great Lakes Kennel Club Redevelopment TIA - TADI - Traffic Analysis & Design, INC.
TADI's Role: : To evaluate traffic operations at intersections along STH 50 and N. Shore Road at initial buildout (Mills Fleet Farm, Meijer, and gas stations) and full buildout of the development site. into a mixed-use commercial, light industrial and residential development. New collector roadways are proposed throughout the property to facilitate movement and provide connections to Borg Road, E. Geneva Street (STH 50), and N. Shore Road in the City of Delavan, Walworth County, Wisconsin. Initial buildout of the site includes a Mills Fleet Farm store and gas station, as well as a Meijer store and gas station. The TIA for the redevelopment of the Geneva Lakes Kennel Club property evaluated two driveway scenarios for the site driveway to STH 50 (full access and left-in/right-in/right-out) and two driveway scenarios for the northernmost site driveway to N. Shore Road (full access and right-in/right-out). Due to the high traffic volumes in the study area, an Intersection Control Evaluation (ICE) report was prepared to investigate alternative traffic control options for the proposed site driveway to STH 50. The ICE report compared the existing two-way stop control to both roundabout and traffic signal control. A traffic signal warrant analysis was completed for the STH 50 driveway intersection, as well as other site driveway locations to N. Shore Road. 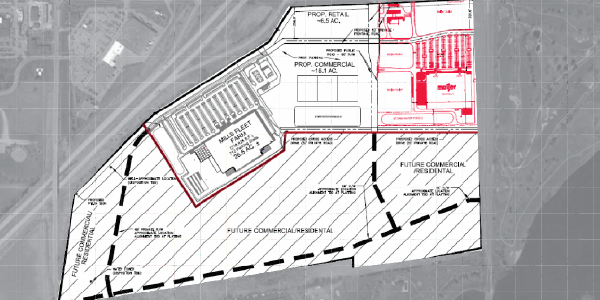 Off-site developments were evaluated to estimate additional traffic impacts from buildout of the remaining vacant parcels in the Delavan Crossings development to the north, plus additional potential commercial and light industrial developments further east of the study area. Recommendations were provided for mitigating delays expected with buildout of just the proposed development site, and with the additional buildout of the off-site development areas.